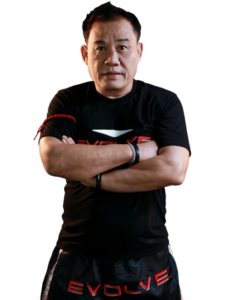 Tenshin Nasukawa is an Instructor at Evolve Mixed Martial Arts in Singapore on a seasonal basis. He is a 2x ISKA Kickboxing Champion, 2x Rise Kickboxing Champion, Rizin Kickboxing Champion, and more. Known for his crisp technique and KO power, the undefeated 20-year-old phenom is the most exciting prospect of his generation and one of the best pound-for-pound kickboxers in the world. He is widely regarded as one of the top kickboxing talents ever to come out of Japan. Despite his young age, he has already fought some of the greatest Muay Thai and kickboxing legends such as Rodtang Jitmuangnon, Suakim Sit Sor Thor Taew, Wanchalong PKSaenchaiMuayThaiGym, and Amnat Ruenroeng, among others. Tenshin is also a member of TARGET/Cygames.